Today's Treasure is something dear to my heart. It's a cross stitch piece to commemorate the birth of my first child. I started it before he was born then finished the details after. As you can see I never had it framed. It's a large piece at 21"w x 12"h and was costly to mat and frame when I became a stay at home mom. Then after the divorce money was super tight and I just packed it away. I feel bad I never had it framed and also that I never made the companion piece for my daughter. At almost 21 and 18 I don't think they really care, but I do. Awww darn it! I didn't mean for this to get all sad! Just wanted to show some creative things I used to make back in the day. 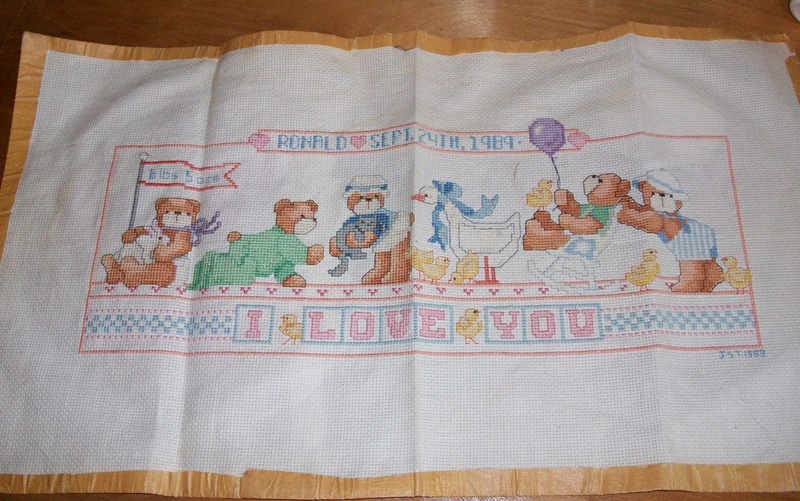 I was the cross stitch queen and made all kids of baby type things for friends and relatives. Do you have any creative efforts that you never finished and regret?